I bookmarked these pictures ages ago thinking I would try and make something similar (but this is a bit like buying fabric you like to make a dress and it sits in the cupboard for 5 years untill you decide to turn it into a cushion). I think that it is a UNBELIEVABLY briliant idea but I wouldn’t choose it for my work space. You know those moments when you are feeling less than inspired to work? Well I think that the globe would just depress me by encouraging me to imagine travelling instead. It could work the otherway and mtoivate by reminding you that work brings in money which allows you to travel. I don’t know….I still love the concept of a globe lamp irrespective. 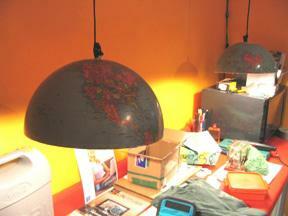 This entry was posted in Blog and tagged creative, desk lamp, globe lamp, idea, light, old globe, Recycle, workspace. Those would be GREAT for a travel agency, or any kind of business that’s focus is global. Wow they are great, thanks for sharing the link. I might have to try and find an old globe and give this a try. Love the globes, I am at the moment looking at replacing the lighting in my house, tired of the ‘chinese junk’ that we put in when we moved here. So these are truly inspirational! Love the globes!Thank you for sharing the link!